Plum Guide and Dynafit Speed have the most similar weight, neither comes with a brake, and they have the most similar height off ski. What is more, nearly every part of a Speed Radical is the same as a Radical FT. Only differences (besides the FT going to 11) are the FT has some small reinforced areas in the rear housing, a brake, dubious heel-toe unit connector plate that can be ditched with no effect on binding performance, and toe unit riser to match taller heel (which is taller to accommodate brake.) At least 99 percent of the population do not need bindings set to release value 12, and RV 10 works fine on both bindings (forget mythology about spring compression; again, they work fine). So Dynafit Speed vs Plum Guide it is. Please know that aside from liking the Dynafit flip lifter better than the old style Plum, I do NOT have a favorite with these two bindings. They both function well and are adequately durable. That said, the Dynafit customer support and dealer system is light years ahead of Plum’s. That alone is a major consideration and will make most shoppers still favor the Dynafit. But Plum has several appealing durability factors, and they do have that anodized “billet” look that might be 1990s but is still attractive to quite a few people. At any rate, below is presented without bias other than minor ruminations. I’ll expose, measure and weigh the stuff. You judge. Binding heel bases with housing and release parts removed. Difference in length adjustment is obvious, as is difference in height (boot in Dynafit ends up 3 mm lower). Heel spindle posts are same diameter. Both bindings are shown with front to right. Click all images to enlarge. When examining the heel units side-by-side, obvious difference is the Dynafit adjusts for boot length with a threaded rod system, while Plum length is changed by moving heel unit for/aft on base and securing with machine screws. When used with care, either method in our experience has been fine though adjusting the Plum takes longer and requires more care (thread locker and plenty of torque). 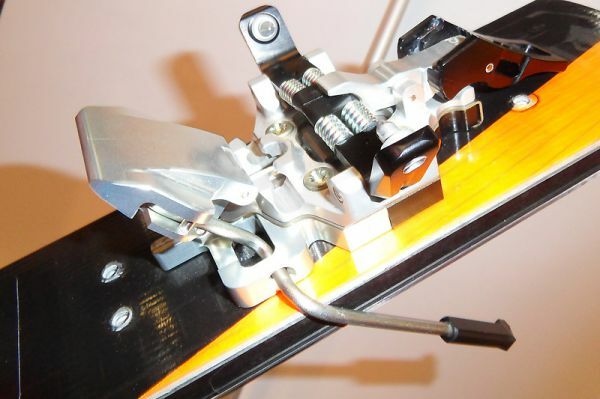 Both the Plum and Dynafit length adjustment systems can be damaged by over exuberant tightening. In the case of Dynafit, running the length adjustment to the limit with a power driver can strip the threaded rod system. With Plum, you can easily over-torque and strip the machine screws. The Plum boot length adjustment system has more solidity in that the upper heel unit is grinched onto the thick aluminum binding base with the screws (I don’t find this difference to be important, but it nonetheless exists). More importantly, the Plum system does allow the binding heel post/spindle to be made stronger as it doesn’t have a transverse hole bored through it as the Dynafit does. Since people have broken this part on Dynafits, this is a valid consideration — though a factor of little concern to all but the most abusive or long-term users. Moving along, biggest difference in the upper internals is that the Dynafit consists of a few more parts than the Plum, and the Plum “slider” (see parts guide above) is an aluminum block instead of plastic. While the Plum is thus easier to take apart and assemble, we see no clear detriment or superiority in either system. Do note, however, that a few of the Plum parts are perhaps stronger than those of the Dynafit, namely, the pins and the lateral release spring cap. Know that despite the Plum main housing appearing to be machined metal, it is actually plastic as is the Dynafit. It appears the Plum plastic housing is machine shaped (CNC) while the Dynafit is obviously injection molded. Heel housings, isolated. Both are plastic. Upper internals as they appear while taking apart or assembling. It's interesting but probably inconsequential that the Plum internals ride in cutouts in the base of the binding upper, while those of the Dynafit ride on top of the lower base, kind of mirror images. Again, the Plum is easier to take apart and assemble, but both are doable with care. With Plum, be sure to completely remove the vertical release adjustment screw before pulling out the slider block. The Plum pins have a thickened area in comparison to Dynafit, 1/2 mm thicker. Since metal quality is as important as size with a part this small, we're not sure which is stronger. But it's nice to see some added beef in this area as pins have been known to break with both binding brands. More, the area _behind_ the visible part of the pin undergoes more leverage and should actually be stronger than the visible part; the shape of the Plum pins accomplishes this and to me is one of the major differences between the two bindings. This is a good example of why we need tech 2.0, which would incorporate much beefier pins with a wider boot insertion pattern. I can dream, can't I? Other than thickness in indicated area, the pins are nearly identical. Plum Guide (left) and Dynafit Speed backcountry skiing binding heels during assembly. Moving down on the heel unit, we now have the lateral release springs. They're virtually identical with the Plum having an added spacer washer that helps achieve release value 12. The Plum spring could also be slightly stiffer to allow higher settings; we have no good way of testing these springs. What we do know is that when setting both bindings to RV 10 they are both fully functional. Disregard any mythology about how setting the Dynafit to the max results in less spring travel or too much spring compression. In other words, if you need RV (release value) 10, you can get it out of either binding. If you need RV 12, Plum or Dynafit Radical FT (the latter of which also uses a washer spacer to achieve higher lateral RV. I've never seen a tech binding spring cap break, but note that in terms of comparo Plum's are thicker. One major difference is the screws which secure the top on the heel units. Plum (left) is a longer flathead that’s countersunk into the binding top; Dynafit uses truss-head screws that sit on top of the plate. We are not sure which are stronger as these screws have been know to fatigue and break with either binding, in fact some years ago Plum sold a batch of bindings that were built with defective screws, and as of 2015 those on the Dynafit have been known to break, so in my opinion this is somewhat of a wash between the two brands. Engineering wise, know that a HUGE difference in the bindings is that the Plum style heel lift places force more directly vertical on the heel unit, while the flip lifts of the Radical place quite a bit of leverage force due to their extending out laterally from the binding. Result, the Dynafit screws and top plate need to be stronger than those of the Plum. Upper heel units, together again. Plum of course has the older style heel lift, Dynafit has the flipper that I've come to love -- but the rotate style works as well. We're not going to dwell on the toe units. They both work fine. Huge differences are steel of the Dynafit vs aluminum of the Plum, and the Dynafit Power Towers. In my opinion the Dynafit would be much less prone to breakage of the wings. The steel Dynafit crampon mount is nice the way it acts as reinforcement for the aluminum base plate. One thing important about the toe units, however: I did a quick lashup with my hand strength dynamometer to measure the retention pressure of the toe unit, by pulling them open to the side. They’re both virtually identical, within the tolerances of my measurement system. Plum heel 230 grams, Plum toe 112 grams, total 342 grams. Dynafit heel 202 grams, toe 152 grams, total 356 grams. Heel height above ski measured to bottom of boot heel sole rubber, somewhat arbitrary due to sole wear and angle of boot in binding. But this was done with same boot to be consistent. Approximately 13 mm for both bindings (ski to boot sole), no way to accurately measure to boot sole due to variations in angle and sole wear. But measured accurately by measuring up to binding pins, and relative to each other, the boot toe in the Dynafit is 2 mm lower than the Plum. Earlier Dynafit and Plum Guide are same, Dynafit Speed Radical heel and Plum Guide heel are same, toe different due to Radical toe screws pattern being changed from old standard. Base widths virtually the same (note that Plum sells other tech binding models with wider base plates, which we feel are mostly of psychological value though they could increase binding strength for aggressive skiers on wider skis). For complete breakdown and assembly instructions that apply to most tech binding heel units, see this article. Oh no – objective data! I could have spent more time, but they were both so similar no matter what I did that I figured my time was spent on something else. Main thing is, truly no significant difference. Lee, all my weights and stand heights, are they not objective enough (grin)? I’m waiting for the video of Lou in his best “WildSnow beat reporter” form, microphone in hand, interviewing a glassy-eyed, disheveled skier about why bindings need to go to 11…. Nice breakdown! Hopefully the introduction of the Plum might produce a little downward price pressure on tech bindings? Nice comparison, particularly in the specific weights of each component. I’d love to see a comparison this detailed of the ATK(Sportiva) touring binding and also to get someones direct experience with durability, etc of the binding. Plum guide is definitely more expensive than speed radical. Lee, Plum users seem very badly to want their bindings to be more “solid” than Dynafit. That’s a valid want of course, but could lead to a bit of bias in terms of how things “feel.” More, it would depend so much on exactly what binding was being compared to what, as well as the need to actually ski a different binding on each foot to truly compare, or else ski the exact same run, with the same skis, on the same day, with the same boots, on the same ski — only with a different binding. I’d bet if that’s been done it’s not very common (grin). The fact all tech users need to keep in their minds is that most of any lack of solidity in the tech binding is caused by the boot shoe twisting on the solidly anchored toe, and even so, the boot/binding connection with any tech binding is easily as good as any recreational level alpine binding, and better than most frame AT bindings. Truly, if you’re a strong skier your tibia probably bends and boot liner compresses more than the binding deflects. The whole issue gets blown way out of proportion. P.S., I’d add that perhaps a wider binding base such as that of the Yak might result in a tiny bit more solidity due to less flex of the ski top. I might test this some day, but my gut says it’s such a small amount of flex as to be entirely psychological. And yes, perhaps wider binding base is more resistant to screw pullout. Different issue. You missed your calling. Stay warmer and go full time as a technical writer. Lou – I love the side by side photos and breakdown. It essentially looks like an aesthetic decision to me. The Plum machined look is very appealing. Why not? favorable “feel” onto something you just shelled out the $$ for. why the u-turn now saying they ski exactly the same, they don’t (yes im a plum fanboy:o)..
Dimitri, Easy answer and you already know it: We have lots of different people blogging here and commenting here, not just me. And my opinion can change as well. You feel the Plum is more solid, so, there you go. I suspect you ski quite a bit better because of the solid connection? As for me, I evaluated the bindings with great care. Nothing stands out that would make them ski better or different, except perhaps the small differences in ramp angle and height off ski. I’ll ski on them more as well, but frankly I don’t expect my skiing to improve because of the bindings. Or, today I ski ok, tomorow on Plums my friends will be saying “hey, how did your skiing improve so fast, you are amazing, let me film you!” Ah, my friends, just having a Plum binding did the trick! lou, you implied that a din 12 more likely damage your knee ligaments. bindings are designed to prevent from breaking. Soft tissue, like ligaments and tendons wil break at much lower forces than bones, even if you set your bindings at 2, you can still break your acl. I would argue that the old TLT Classic/Speed is more durable than either. There have been suspect toe wing breakage on Plums and heel failures on the Radicals. Apart the longer adjustment range and brakes (not insignificant, I realize, but not hard to add to the old design either), what real improvements (as opposed to marketing BS) have come with newer tech bindings? Comforts- have more fragile heel posts that develop play, and easy to break volcanos, easy to break crampon attachment. And they’re heavier. Vertical ST- nice revision of the Comfort, but the heel is still more fragile (both the volcano and the spindle thingy) than Speeds. And they’re heavier. Vertical FT- Toe wings hang over the base plate, causing multiple problems. And they’re heavier with stupid fake carbon fiber cladding. Radicals- Heels have more problems than Comforts with anti rotation pins and flippy lifters. Plums- Aluminum toe wings? I’ve seen them break without an impact during normal use. I’m not saying ANY of these bindings are no good. I am quite happy with my Comforts. And I’ve been happy using most of the above. But It seems clear to me that many changes to tech bindings over the years were driven by marketing folks, and a desire to attract new users. Jeez Rod, I was just making a point (grin). Ben, you are exactly correct. One of the big tensions in any product design and manufacture is how much influence the marketing people have, especially when what they want gets in the way of simply making something that works. I can go on record and say I would have liked to have seen more engineering and less design in the breaking tech bindings over the years. It’s been quite disappointing at times, starting with Tristep and moving on up the chain. But some of the breakage is simply due to everyone trying very hard to keep things light in weight. With more mass to play with, some of the breakage probably would not have ever happened. In other words, some of the parts are so small and sensitive that no amount of pre retail testing can find every problem, since slightly changing the manufacturing process for retail can change a sensitive part which ends up breaking, and only being found out by consumers. A good example is the breaking heel lifter on the Radical first generation. At any rate, I always advise against early adoption of any tech binding. A year of consumer testing, then get ’em if they pass. As for the older Dynafits, they had their problems. Let’s not get too starry eyed. the toes essentially the same at 13 mm with the dynafit 1/2 mm lower. Bill, sorry to confuse, I’ll look back at that but I can tell you that some of the measurements are not related to each other in the way I got them. The ramp angle height measurements are done by measuring height of toe and heel pins above ski top. They’re independent of measuring the height of the boot off the ski, which is more approximate as I’m measuring from the sole rubber down to the ski and involves picking exact spot to measure on sole, rocker, sole wear, etc.. But I’ll check everything and clarify. One thing you’ve missed in comparing the two is that the highest heel lifter height on the Radical is a fair bit lower than the Plum (or the older Vertical ST/FT). To have the same height you need an add-on “nubbin” (B&D makes a nice one). That may not matter to many skiers, but here in central Idaho where we seem to measure our manlyness (or womanlyness ) by the steepness of our skin tracks it matters. I’ve skied both bindings on a number of skis this year (Sportiva Lo-5, Voile Vector, BD Amperage for the Radical ST) (Sportiva HI-5, Coomback, H2O on the Plum Guides). My beloved Manaslu’s have Vertical FT’s, and my HI-5’s had Sportiva binders before I re-mounted them with the Plum’s. All skied w/TLT 5 Mtns. Here’s my thoughts: Despite being initially excited about them, I’ve discovered I don’t love the flip heel lifters. I find myself missing my Vert FT’s. Maybe hundreds of days of touring have just made rotating to switch heights more natural. I find it awkward to rotate the Radical three “clicks” around to go from walk to ski mode. What I don’t miss about the Vert’s is the exploding heel volcanos. I’m a solid guy and went through 3 last season. No need to worry about that with the Plum’s. Just a quick comment on Plum customer service, which was mentioned as inferior to dynafit’s. I’ve never used dynafits, but love my Plum guides (on liberty helix’s). The only issue I’ve had was a stripped thread on one of the screws securing the top plate of the rear housing. I made email contact, and at a time that suited me they arranged courier pickup from Scotland, serviced them and replaced the original machine screws with a coarser thread and sent them back. Very rapid turnaround, great support and advice. All in all an excellent service. Paddy, with that quiver you should do a ski review too. Love the hear the Manaslu, Vector, Hi-5 comparisons. Hey guys, first time poster here, been checking out the site for a while, good stuff and great info. Couldn’t resist chiming in as I’ve been riding on the Plum Yaks this season. I’ve put a good number of days on them and would like to share a couple comments. I put this on the other Plum thread too. 2. One of my heel pins has come loose (i.e. it has some play in it). It is definitely noticeable with the boot locked in, I can feel it jiggle within the boot. This has only happened on one binding and have an inquiry in to Plum about it. Definitely still ski able and don’t notice it too much while going down hill, but it’s got to be affecting stability to a certain degree. I’m not too comfortable taking apart the heel unit to see what’s going on inside. Any thoughts? Matt, take the heel units back to your local dealer. if they are loose chances are it is the plastic housing..
Can you share some tips on using the radical heel flippers. I personal struggle with those heel pieces vs the older cones – especially when changing over to ski mode as I prefer not to take off my ski . I find it extremely ackward to reach down an twist the heel piece. Maybe my arms are just too short but I swear I feel like my shoulder might pop. It also seems to take me several “wacks” at the heel to change the riser. Since you prefer the newer heel maybe you can share some techniques that’ll help. @rz–I’d like to hear Lou’s comments too. I too like the lifters on my speed radicals and Radical STs. They are easy to manipulate using the basket on my ski pole; depending on the situation, I’ll also use the pole tip, esp. in moving the high lifter back. Very quick and easy once you get used to it. I use the speeds on my Karhu Guide waxless skis. Because I rarely use skins with these skis I was getting a little perturbed at having to take the ski off to twist the heel into downhill mode. I found I could cross the ski whose binding I wished to twist across the front of my other ski and reach down and turn the binding; it is even easier if there is some uphill/snow mound on that side of the ski being crossed. You can kind of rotate the Radical’s with a pole. Put both lifters “down” (in the flat-walk position) push your skis back a few inches (gives space between your heel and the ski), put the tip of the pole into the gap underneath the bottom of the high heel lifter and rotate. You may have to push your heel out (make a “V” with your skis) a little bit to have the space/leverage to go all the way into ski mode. Like I said above, It’s kind of annoying. I skied Hi-5’s and Plum’s today. We had to bail down a BULLETPROOF south slope in the face of crazy winds. Having to do weird yoga to go into ski mode while tenuously clinging to my edges would have sucked. I’ll do a Manaslu/Hi-5/Vector comparison later when my thoughts are more coherent. Realized the instructions above are a little off. Low heel lifter should be deployed, High lifter down. Rather than both deployed. the new ATK binding looks really sweet too! A couple of thoughts jumped in my head as I was reading this review. Comparing distro networks and customer service of Dynafit and Plum is certainly not apples to apples. Dynafit is 20 or more times the size of Plum. I would guess the yearly budget for Dynafit’s customer service exceeds the yearly profits of the entire Plum company. It also looks as though the heel pins are set deeper into the heel housing on the plum binding as well as the springs are seated in metal not plastic. I’m not sure how that translates to skiability, but to me it just looks stronger/more secure. I have had a few friends talk about the hiking flippers being the first item to break on the dynafit, I don’t have a dog in that fight as I use pre flipper Vert FT, but it seems to me the less moving parts the less parts which can fail. The toe retention spring test is really a non issue as from the sounds of how it was executed is was a little shady. As far as people feeling it skis better that is up to them. I have a number of friends who ski dynafit and love them and I have a few who ski plum and love them. To me it is really simple if you feel the plum skis stronger than the dynafit great if you don’t that’s great to. From what I’ve seen the plum looks to be a heartier version of the dynafit. Yes Lou, plum did exploit the expiring patent to build a stronger mousetrap, but throwing your own twist on an idea is how our industry makes better gear for us to use. (have you altered any of your gear to make it better for your use?) One statement you made which i would be interested in seeing your data on is that tech bindings have equal or better coupling compared to alpine bindings. I find that hard to believe mostly due to the service area of the boot and binding coupling being easily 200% more than a tech/boot coupling, let alone the elastic travel argument. Great review. It was a little biased, but every reviewer has a little bias about the gear they use. I read a thread on TGR about the new rossi soul 7 bc ski. what have you hear about it? Scooter, I did a test with repeatable results, for rolling deflection, and included a Marker recreational alpine binding in the mix, which I managed to stuff the test boot in by grinding off the sole quite a bit. I made it fit good, with contact on AFD etc. It deflected more than some of the touring bindings..
All binding deflect. It’s actually an issue that is somewhat blown out of proportion. But fund to talk about. 1. With binding still in touring mode, genuflect down. 2. Reach behind and twist binding to alpine mode. 4. Stand up, rip skin, then step down on heel to enter downhill mode. OIr step down into alpine mode first, then rip skin, depending on your genetic makeup. 5. At some point in this process, unlock binding toe if so desired. So, all I can say is that if you’re attempting to switch to alpine mode without taking skis off, try the genuflect way of getting down low so you can twist the binding heel unit. If skins have a tail attachment, that’ll be a separate step in the process. That’s a interesting test. I’ve seen something similar done with alpine bindings. Across all the manufacturers, guess who had the highest amount of deflection? Marker. I would certainly agree with you that deflection is not a big deal in the back country as we’re all skiing soft snow. On hard snow at med to high speeds it plays a much bigger role. this page also has an interesting item from Trab a couple photos higher up…. Hey Lou, I ski with TLT 5’s and speed radicals. I’m about to mount up a pair of Manaslu’s and I was thinking about some strategies to reduce my forward ramp angle. I’ve been skiing with the same boots and binding on a pair of BD Drifts feeling like I’m leaning way forward. My idea was to call Dynafit and order some Radical ST toe-baseplates to mount under my Speed Radical toe pieces in hopes of raising the front of the boot a few mm’s. Do you think this is a good idea for reducing my ramp angle or are there easier ways of going about this? Thanks for any suggestions or help from anyone in the community! Ben, hah, I already did that! Works well, just remember to get screws as well as the plates. In other words, you’ll need the front 8 screws used for Radical toes. Please please let me know how well it works for you in terms of how they ski. Also remember that the heel lifts will be somewhat less effective with the added height at the toe. And before all that, are you using the lesser cuff lean angle on the 5s? And are you using a liner that’s jacking your calf forward? Thanks for your timely response! My liners are great, if anything they are helping me out in this situation (intuition alpine liners). I have a first generation pair of 5’s… So I don’t have the option for a more upright forward lean. Did dynafit ever come out with a replacement metal piece for variable forward lean? I never tried to modify the existing pieces in my boots. I know you reported at one point that they were talking about offering something aftermarket to help with the problem but it didn’t seem to come to fruition. I actually spied you at OR when you were at the Dynafit booth, never introduced myself though. What is the story with the forward lean on the new TLT 6’s? Problem addressed or what? Anyway, let me know what I can do with my boots if you have any ideas with regards to forward lean. Try above first, before customizing binding. The problem with customizing binding is every time you switch to another ski/binding combo you’ll have to do the same thing. Might not be a big deal for people who don’t switch skis much, but for me it’s a real problem. So I experiment with binding mods, but in the end I tend to mod the boot and not the bindings. Thank you for the comparo – very interesting as always. Regarding the position of the heel pins on the tech bindings being so high… why is that? I’ve seen many references (on this site and others), making claims the tech bindings allow for the boot to be close to the ski and I just don’t find it so compared to my Marker alpine bindings. I understand if brakes are being used, then there must be some space between the ski and the boot to accommodate them but I’d think that with binders like the Guide or Speed, it’s obvious they’re targeting the weight-conscious skier (yes, I know, many folks are crying for the brakes). Anyway, just curious about this and also wondering if there would be a detriment to having the heel sitting lower (really close to the ski with some minimal space for ski flex). Also, just got the Guides and am quite disappointed that the ramp is another 3 mm bigger compared to (most?) Dynafits as I find it easier to bend my ankles to achieve a more aggressive forward lean when needed (e.g. on bullet-proof surface) than wrestling myself into the back seat in heavy and deep. Why is there not a Plum binding competitor here in the USA? We have people making plates, and other binding parts. Is there a dyna patent here in US that prohibits it? Or is Plum licensing from Dyanafit in europe? 1. Liability risk is much more difficult to manage in the U.S as opposed to Europe. 2. The European market for ski touring bindings is huge compared to North America. I’ve been told several times that the whole of Canada and the U.S. is the approximate equivalent to one European alpine country, e.g., Switzerland, Austria, etc. That’s not insignificant and does support importers such as Salewa North America. But being an American innovator selling bindings out of your car trunk is not the same thing as doing so in Europe. And small-scale selling and manufacturing is where many of the tech binding makers have begun. Ditto, finding financial support for something new. 3. There are financial support systems in European Union countries, for small industry startups. Sure, we have some grant systems and such in the U.S. and Canada, but from what I hear such money is easier to obtain in the EU. 4. While the basic patents for Dynafit “tech” bindings have indeed expired, the Dynafit /Salewa company still holds numerous patents on specific parts of the binding. While bindings such as Plum may appear to be somewhat unique, as I tried to show in the blog post above they are essentially copies (very close copies) of the LowTech/Dynafit binding originally invented by Fritz Barthel. To the best of my knowledge, for the purposes of good will Salewa has in many cases chosen not to enforce some of their patents, but I do have first-hand knowledge that they litigate. I’m not sure what the difference is between patent litigation in the U.S. as opposed to European Union, but I have to suspect that the cost and risk involved in this are less scary to the innovator (or copy hacker) in Europe than in the U.S.
5. The internet frequently makes too big a deal out of small product defects that affect a limited number of people. Dynafit bindings work in their stock form for hundreds of thousands of backcountry skiers. What is more, Dynafit has a very strong brand that’s the result of huge amounts of work on the part of their marketing folks as well as their tech guys constantly improving their products. To essentially copy a Dynafit binding and expect to sell enough to break even or perhaps make a profit is daunting. Especially when there are already a bunch of competitors out there selling their own tech binding copies (improved or otherwise). 6. Companies with “vertical” product lines such as Salewa have a variety of methods to encourage (or to put it in none PC terms, “force”) retailers to carry specific products. A person doing a start-up company selling tech bindings will find this to be a daunting challenge. Double that for a person who has no experience with bringing a product to retail. Anyone else care to guess as to why we do not yet have a tech binding maker other than G3 in U.S. or Canada? FWIW, G3 is Canadian, and make tech-style bindings. George, I should have mentioned G3 as the proverbial exception to the “rules.” My bad. One has to assume that G3 is up against all the challenges I related, and perhaps more. Kudos to them for actually pulling it off! At any rate, they are the only ones in North America. In Europe there are dozens of folks trying to sell their versions of tech bindings. What do yo think about the Plum’s shorter heel pins? Thanks for the detailed response, much appreciated! I suspected as much, but figured you would have your “finger on the pulse”. Excited for the coming snow season and reading your site. My Dynafits engage 5.5mm and my 2 year old Plum Guides engage 4mm. Maybe there has been a change? John, I don’t understand what you mean by “engage.” Are you talking about the amount of pin thats past the boot fitting, after the gap has been set to the manufacturer’s recommended distance? Also, perhaps there has been a change, as the current Plums we have here do have the same length pins as the Dynafits. It’s very possible that older Plums used the older shorter Dynafit binding pin length. I went out to the shop and physically measured the pin lengths, the amount they protrude from the binding. The measurement is virtually the same for a 2012 Plum and 2012 Dynafit. The amount of boot the pins engage would in this case be dependent on the gap. 11mm for the Race and old Plum Guide, and 12.5mm for the Dynafit FT, according to crummy calipers. Ok, it sounds like Plum was simply using the older dimension for their pin length on earlier bindings. The Plums I have here are virtually identical to Dynafit. Most skiers would never notice the difference. Out of curiosity, did you? for lightweight binding for general touring. No extreme skiing. why not a race binding versus the guide or the speed? Sounds like release is reasonable at 7.5 din or so. Only one heel lift. They all look about equally strong. Does this make sense? Lou, I’m a long time Dynafit user, with an unresolved issue with the heel unit pin spacing on 2012/13 and current Speed Radical bindings. Dynafit USA acknowledged (recent phone conversation) that they’ve changed to a slightly wider (~0.3mm according to my measurements) spacing from the Vertical series and 2011/12 Radical series, which for me results in obvious and unacceptable play in the boot – binding interface, loss of performance, and occasional pre-release. I am considering Plum as an alternative, so would be very interested if you could compare the heel pin spacing, measured with vernier calipers at the narrowest point. Hi Stewart, we run a lot of Dynafit bindings and have not experienced the “heel pins spacing play” problem, though I have heard of it. I measured one of our Radicals and a Plum Guide, outside width of heel pins at approximately the narrowest point (difficult to get perfect measurement because they taper) is 24.32 mm for the Plum and 24.39 for the Radicals. Both function without play or slop in the boot/pin interface. I don’t know what more I can tell you. Are you just curious, or are you gathering info for a warranty return? My advice to anyone with any tech binding is to not accept unusual slop or play. We hold all brands to this standard. Indeed I decided on the Plum over the Speed radical. Just wondering , in regard to the plastic on the heel pieces, I believe Plum referred to theirs as aerospace polymer??? Anybody know anything about that?? Lou, I measured the inside (which contacts the boot) spacing at the narrowest point of the taper the boot, and measured a 0.25mm difference between the 11/12 and 12/13 bindings that I own. It’s admittedly only a sample of one, but then Dynafit customer service sent me a single replacement 12/13 heel piece, and it measured the same as the bindings I was having issues with. I was beginning to feel like a crazy conspiracy theorist until Eric (Henderson?) acknowledged that Dynafit have moved to a wider specification, without providing any details. He also suggested that I consider Plum bindings, but rather than guessing my way to a solution, as a very demanding full-time professional user I’d like some facts. Stewart, one fact about all this is that any manufactured item has a certain tolerance range for dimensions. I’d say getting down to 1/4 of a millimeter tolerance for the pin spacing on tech bindings is approaching the point where if you measured 100 different bindings, you’d see variation approaching that. That’s about 1/2 millimeter difference between the Plum and TLT, and both work fine with all our boots, no play, as does the Radical. My take on all this is simply, If your boot rattles in the binding at the heel, it shouldn’t, and a warranty replacement or switching brands are two options. Also, always consider the boot as well. Boot fittings have been known to be defective. As I tell all readers, any time you get weird behavior with a tech binding, first test with several different boots (of different brands) to make sure it’s not the boot fitting causing the problem. As for what you heard from Dynafit, that would be second or third-hand information even from them, unless you were talking directly to an engineer in Europe, who had the dimensioned design drawings in front of him as well as the dimensioned drawings for older bindings. Yes, my measurements indicate Radical pins are wider spaced than TLT, but that’s just one or two measurements, and again, they all still work fine for us and in the above case narrower than Plum! Oh, and one other thing: Boot fittings and binding pins do wear, especially when used for lots of resort or tramway vertical. What boot brand and model are you using, and are the boots high use? Lou, Thanks for your thoughtful consideration. My boots are 2011/12 Titan ULs, with which I have no issues in my 2011/12 Speed Radicals and Vertical ST bindings, but exhibit unacceptable play in my 2012/13 Speed Radicals from when both were as new. The mount is perfect, and no adjusting of the forward pressure makes any difference. My older bindings are nearing the end of their reliable life, and I have a new pair of Carbon DPS skis ready to mount, but I’m no closer to solution, other than taking a chance on something, and then hoping it works once mounted. I’ll admit I’m particular when it comes to binding play – I’ll only use alpine bindings with vertical toe height adjustment as automatic systems are not precise enough, but this hasn’t been an issue previously in over 10 years of heavy tech binding use. I’d love to know what clarification you could get out of Dynafit on this. i have a dynafit question, i hope it is ok to ask here. i have an old pair of tri-steps (i believe they are the very first version, i read your blog about them but for some reason pictures don’t show so i can’t confirm), i had all kinds of problems with tri-steps (mostly released in touring mode) but i was also a beginner back then, then i stopped skiing (it hurts just to think of that) and when i started skiing again i got comforts which i have never had any issues with. Myska, the photos should work now, try it please and let me know. I just spent all morning reworking the old Tri-Step FAQ, making it into a bit more of a history piece. Sheesh, now I need to get on something more current! This is probably being too persnickety but how about combining Speed Radical toe piece (for ease of entry and Power Towers) with the Plum Guide heel (for those of us who like the old style volcano and ability to switch from ski to tour mode without taking the ski off)? It appears that you can buy the toe piece by itself from Spark R&D and the heel piece by itself from the Plum website. Ramp angle unchanged over complete Plum set. Thank you for all of the great write ups! I have been debating what type of binding set up to use (plum yak vs dynafit radical ft or a combo plate) for lotus 120 pures. I think I would be too lazy to use a combo plate as well as adding the excess weight seems to somewhat defeat the purpose of going with pures to begin with. One of my main set ups last year were Radical FTs mounted on Wailer 105s. I absolutely loved them and ended up skiing in-bounds a lot more than I expected. They were my go to ski in all conditions it seemed and withstood a lot of abuse. They held up really well. I have a shim under the toe and road them neutral ramp (which was sweet). I am going to continue to use them this season. Since I have a lot more confidence about Dynafit durability my question is less about that vs Plum and more about the binding plate of the YAK vs a shim under the Radical toe. Would the Plum Yak plate noticeably transfer more direct power from the boot to the ski (122 mm under foot) than the Radical with a shim under the toe? Or is it negligible? Fwiw I took your advice on k2 180cm backups evo steal deal, mounted the speed rads with your template and have skied them two days on early season east coast manmade, refrozen in my maestrale RS…. Amazing. Ive skied 40 years, raced in school, and still ski regular hardpack resort on Lange rx 130s/zipfits ontop of FIS 27m 185 blizzard gs and FIS Fischer SL 165s with marker comp 16 and Fischer z16 binders. So far I am blown away at the feel of the speed radicals on these k2 backups….Im not Ted Ligety, but I still smoke a lot of the people around me. Am I missing something or is this a practical part time inbounds setup as well as BC? Seems like good edge hold and retention while dropping a ton of weight. Sorry if this is a bump, but did not know where to fit this feedback. Just an FYI for those using the wildsnow Dynafit mounting templates for their Plum Guides: Following the Dynafit template’s bold line for the back of boot heel places the Plum unit towards the back end of its adjustment track. You might want to set your Plum heel unit further back than specified on the template if you want to end up in the middle of the adjustment range. I am on my second generation of plums with are two years old and are going strong. What is the best ski crampon for my Plums (with black toe wings). My Dynafit brand cramps work but the fit is tight and they are hard to fit in the crampon slot, escpecially on the fly. Plum has come out with some Plum brand ski crampons that are supposed insert differently than the Dyna cramps. Does anyone have any experience with these or suggestions for any other brands to use with my plums. Hello I would appreciate some advise please. At the moment I have the K2 backup and TLT speed Radical binding. I am 80 kg and strong legs and on ascent i fly ! but i have very difficult time controlling the skis on descent when the terrain is hard and rough. Ths skis just “flutter”, i cant finish the turns. Will it help me to get for example K2 wayback or coomback, or I must change bindings also.